In advance of tomorrow’s African Leadership on Child Survival meeting in Addis Ababa, Ethiopia, the Ministry of Health organized a media site-visit to showcase their community health extension program and its impact on the country’s tremendous reductions in child mortality. I was taken away from the hustle and bustle of Addis to the Aleltu district, which is north in the Oromia region. The visit began at a health center, then a health post and finally I visited households in a kebele (village). I saw firsthand how the health extension workers along with the voluntary community health promoters, called the “women health development army,” are key to Ethiopia’s health infrastructure. Health extension workers have finished secondary school, or grade 10, and have been through one-year of training that covered 16 components under four categories: family health; disease prevention and control; sanitation and hygiene; and health education. This is called the health extension worker package. At the health center in Mikawa, the capital of Aleltu, I observed kids getting immunized and women accessing prenatal care. 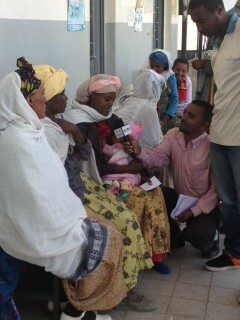 Two women with their newborns in the waiting area agreed to be interviewed by the press. Both commented on how they learned about family planning from the center and how birth spacing leads to healthier children. They planned to wait three years before their next child by using family planning methods offered by the center, which is funded by USAID as part of an Integrated Family Health Program through JSI and Pathfinder International. Finally, I visited a household in the Wogiti Dera village, designated a “model household” because it successfully completed a checklist of 16 good behaviors consistent with the 16 components in the health extension worker package. Examples of good behaviors in the package include: women delivering their babies with a skilled birth attendant, children being vaccinated, and the household practicing good sanitation and hygiene. What was consistent throughout the visit was an emphasis on data to measure impact and performance. This information feeds up to the regional and national level to populate a scorecard to measure Ethiopia’s progress in reducing maternal and child mortality in the region. The community health extension program is one of many best practices that will be shared at this week’s African Leadership on Child Survival meeting. I’m an Ethiopian physician specialist in Tropical Medicine. I can work in any international team, esp. with USAID. If there has to be any need,contact me c/o this e-mail, or phone: 0039 328 6923988. Thank you.